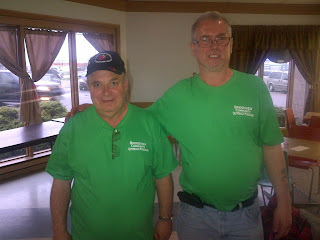 The Bridgeview Community Outreach group held a very successful fundraiser at the Moose Lodge on Tecumseh Rd. W. right next to Bowlero. All proceeds will be used to further develop the group's initiatives in helping youth in the west-end. Below are some pictures from the fundraiser. "Hi Fabio, can you mention in your next email that I am still collecting pennies for Parkinsons or any donation that anyone may have. The proceeds will go towards making life more comfortable for those afflicted with this disease. Parkinsons is a progressive neurological disease that affects over 100,000 canadians and the numbers are predicted to be much higher as the baby boomers age. Donations can be dropped off at 910 Bridge Ave or reply to me at jrenaud13@cogeco.ca, thanking you all in advance, Joe Renaud"
"Please join friends, family and classmates to raise money for St. John School. Simply come have dinner at Swiss Chalet on Huron Church on Tuesday, April 23, 2013 between 4:30 and 7:30.Mention you are supporting St. John School when ordering and a portion of your order will go to the school. This includes orders from dining in, take-out and drive thru. We hope to see you there!!" 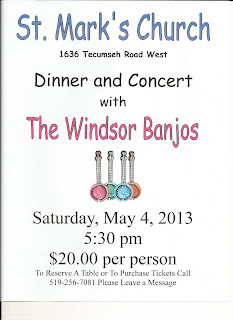 St. Mark's Church is hosting a dinner and concert with the Windsor Banjos on May 4th. Please see the flyer below. There will be a pasta dinner fundraiser on Sunday, April 28th, between 3pm - 8pm at the Moose Loyal Order of No 1499 located at 777 Tecumseh Rd. W. right next to the Bowlero. All proceeds go to the Bridgeview Outreach for Youth Group, a grassroots organization committed to engaging youth in the west-end and including them in the community. Tickets are $10. To purchase tickets or learn more, please contact Wilfred Birch at 519-977-5510. Thanks! Community Coordinator for Windsor's West-End - Now Hiring! I am posting a position for a Community Coordinator for the West-End. Once a successful applicant is chosen, a very positive announcement will follow. Spread the word with friends and family. Thanks! I received the notice below from a fellow west-end activist and friend. If you have time I would strongly recommend you go attend. "Good Morning Fabio: Thought you might be able to post my message for others to read. I have signed up for City Cleanup & plan on cleaning the alley way between the 100-200 block of Campbell & McEwan. I have dropped off about 20 short notes to a # of neighbours, hoping to get some help in this endeavour. The date is Sat. April 13, with Rain Delay Date Sat. April 20th. The City is going to drop off a box of garbage bags & gloves @ my house & will pick up the filled bags when completed. We can meet @ 9:00 a.m. @ the North end (closest to Riverside Dr.) of the alley. Anyone willing to help should also consider bringing a broom & or shovel. Thank you Fabio & anyone willing to help clean up our neighbourhood. Mary Fox, Campbell Ave. resident & supporter of The West End!" If you would like to learn more, you can contact Mary at fn1941noon@hotmail.com. You may have felt your house shake Thursday morning just before 8am. I know I did, followed by a constant hum for a minute or two. The incident occurred at a storage terminal operated by Plains Midstream Canada. You can learn more about it here: Explosion in Windsor's West-End.